Before coming to UBC I was the perpetual “new kid.” I had attended ten schools by the time I was 16 and lived all over the United States. Today, I can proudly say that I have mastered the art of friend-making. And with these tips, you can too. Residence is the best place to make friends. 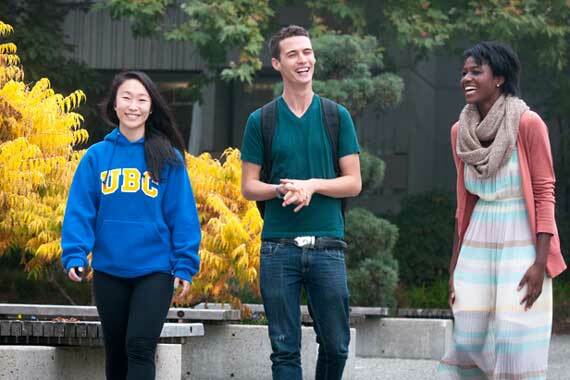 Everyone is in the same boat: new to UBC and looking for people to hang with, study with, eat meals with and explore with. These folks will become your second family, so get to know them. Go to your floor and community meetings and be sure to get out to FirstWeek—that’s where a lot of people connect for the first time. Here’s an easy way to meet people when you’re in your room: just leave your door open. That signals to your floor mates that you want to get to know them. Look up and smile when people walk by. Chances are, they’ll peek into your room and give you a smile or a wave, too. And when you walk down the hall, take your floor mates’ open doors as a signal to say hi. If you want to make friends, look approachable. Some people don’t get this. They wear their earphones, check their phone or avoid making eye contact. Those things send a signal—whether it’s right or wrong—that they don’t want to interact. To appear approachable, sit at a large table in the library or cafeteria. Smile, make eye contact and say hi when someone sits down. And invite others to join you—it could be the beginning of a new group of friends. Facebook is one of the best ways to meet people. Search for groups for your residence, your school year or your floor. You can read about the people in the groups and then, of course, meet them in person. One last thing: We’re all adults here, and you can be friends with anyone, of any age, in any year. We’re all here to learn, grow and make new friends. We acknowledge that SHHS and UBC are located on the traditional, ancestral, and unceded territory of the Musqueam people. We thank the Musqueam Nation for its hospitality and support of our work.